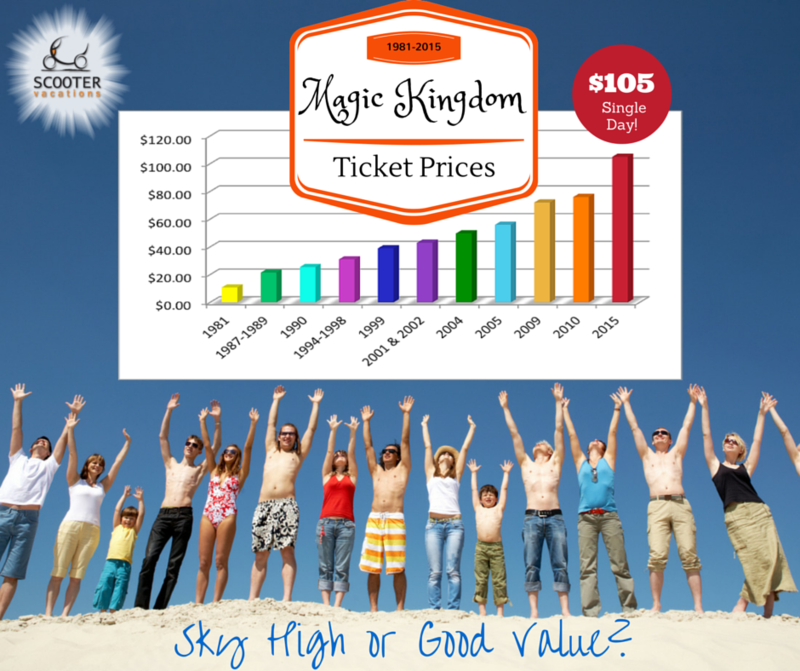 Since Disney World just increased ticket prices, I thought it would be interesting to review how and when the prices have increased since opening. Did you know that when Magic Kingdom opened in 1971 the entry ticket price was $3.50. That is about $20 in 2014 dollars according to Time Magazine. In October of 1971, Walt Disney World only consisted of the Magic Kingdom Park. The entry ticket gave you park access and you could enjoy any attraction that did not require a ticket to ride such as shows like the Diamond Horseshoe review. For rides you could purchase individual tickets or a book of tickets. (Remember those coveted E Tickets?). What was nice about this system was it let grandparents and those who were not interesting in riding rides come along with the family without a huge expense. Of course those days are long gone. In 1981 Disney started offering unlimited ride tickets and fully discontinued the ride coupon system in 1982 when EPCOT opened. They also changed the age for a child ticket in 1987. Instead of a child ticket being ages 3-12, they changed it to 3-9. And a few years back they changed the Annual Pass to eliminate any difference in a child versus an adult price.